Social media is an extremely powerful medium that allows you to connect with your audience even easier than ever. While this is true, most businesses are still unsure about how to use social media effectively and how to track social media activities. It is easy to spend a lot of time on social media without knowing what your business is getting back from the time invested. Here we will talk you through a few tools that we use, and one that we have built, which are all designed to help you manage your social media work effectively. No longer will you have to use guess work to measure performance, instead you can use these selection of tools to track all social media activities effectively. Ok, so you’ve just created some awesome content on your website or blog and now you want to share this with the world on your various social media channels. Firstly, it is important to tag all of your links up that you are sharing so that you can easily see how many people have clicked on these links from the various social media channels. 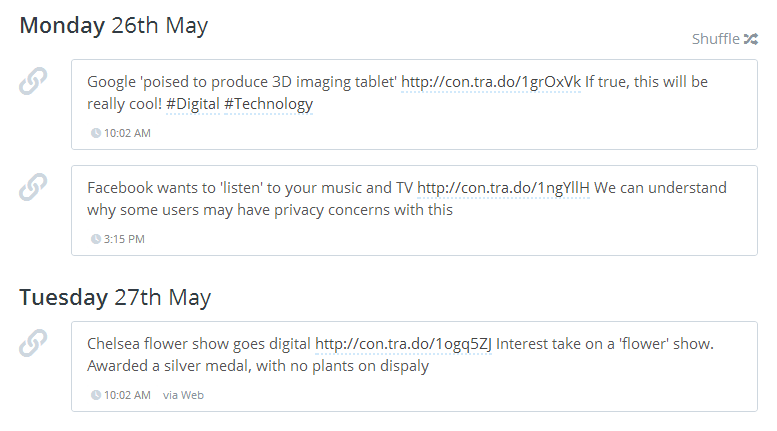 To tag up your URLs that you are sharing you can use the Google URL Builder if you have custom and individual requirements, or alternatively you can use our new Social Media Tracking Tool. This tool is designed to speed up the process for updating social media channels and tracking the number of clicks received from the different channels. By default, links that aren’t tagged will not be tracked accurately within your web analytics tool such as Google Analytics. The reason behind this is due to the ‘referrer’ information not always being passed from the source through to your website when a user clicks on the link from various sources including native applications, i.e. a Twitter App on your followers’ smartphones. When this happens, it will appear that traffic to your website from social media channels is ‘Direct’ traffic, which isn’t the case. Our new tool will tag all of your links up automatically, saving you time manually updating each link with the correct campaign tracking tags. Have a go and see how easy the tool is to use. As can be seen above, this is great data to understand what your fans and followers are most interested in reading about. Knowing this information will allow you to tailor your social media updates to content that is most interesting for your audience. Now you have your list of links that you want to share on social media, you can easily schedule these updates to save you having to spend all day on social media. Simply schedule posts to be sent out automatically throughout the week and save yourself hours of time, allowing you to continue running your businesses. As you can see above, here are a few of the scheduled posts we have. With this tool you can easily set custom schedules for each of the social media accounts that you connect to Buffer. The simplicity of this tool is brilliant and really does all you to save an enormous amount of time managing your social media activities. Now you have all of your content scheduled to your social media channels, you need an easy way of managing engagement from your fans and followers. While you can simply hand out your login details to several members of staff to manage social media for you, this will inevitably lead to challenges. For example if a member of staff leaves your business, you will have to change the passwords. In addition, you may have an external party like ourselves managing your social media channels and you would prefer we didn’t have your passwords. Tools such as HootSuite get around these issues by being able to manage social media channels without logging in/out of each social media account through the day. This really helps to reduce the management time along with increase the response time when responding to fans and followers on social media. Now you have all of your social media activities working well, tracking is the essential part of this. Tracking is available within all of the tools mentioned above so it is always recommended to monitor each of the individual tools. Social media can be a great way to drive additional traffic to your website and as mentioned earlier, our new Social Media Tracking Tool allows you to easily track this data within tools such as Google Analytics. This traffic is broken down in Google Analytics based on the way that you tagged your campaigns. Thankfully with our new Social Media Tracking Tool, you don’t have to worry about this as the tool will automatically tag all of your campaigns quickly and easily for you. Once you start to use this approach with your social media activities you will be able to quickly see which channels are driving the most traffic to your website. Most importantly, this traffic data will now be accurate since if campaign tracking tags aren’t used, then this is likely to be under-reporting on the results the social media activities are generating. Hopefully this has given you a good selection of tools and explained clearly how these various tools can be used to manage your social media activities effectively. Save yourself a huge amount of time using the above tools. These tools are our preference when managing social media channels, if you have any other tools that you like to use, then leave a comment, we’d love to hear from you.